I normally recommend oil changes every 50 flight hours or 4 months, whichever comes first. (If you fly less than 150 hours a year or your flying tends to be seasonal, the 4 months will usually come first.) I often suggest shortening the oil-change interval after certain engine maintenance (e.g., cylinder change) or if oil analysis results reveal elevated wear metals. It's important to understand why the oil needs to be changed so often. It'snot primarily because the oil breaks down in service and its lubricating properties degrade. 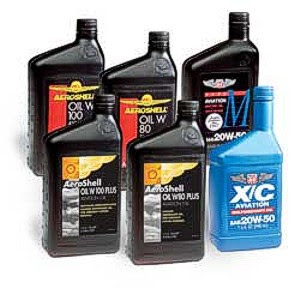 Petroleum-based engine oils retain their lubricating properties for a long time, and synthetic oils retain them nearly forever. Consider that cars typically go 7,500 miles between oil changes, which is the equivalent of 150 to 200 hours. Studies have shown that synthetic automotive oil like Mobil 1 can go 18,000 miles without appreciable degradation, and that's equivalent to 400 to 500 hours. The reason we change oil in our aircraft engines every 50 hours or less is not because it breaks down, but rather because it gets contaminated. In fact, it gets downright filthy and nasty. That's because compared to automotive engines, our piston aircraft engines permit a far greater quantity of combustion byproducts -- notably carbon, sulfur, oxides of nitrogen, raw fuel, partially-burned fuel, plus massive quantities of water -- to leak past the piston rings and contaminate the crankcase. This yucky stuff is collectively referred to as "blow-by" and it's quite corrosive and harmful when it builds up in the oil and comes in contact with expensive bottom-end engine parts like the crankshaft, camshaft, lifters and gears. To make matters worse, 100LL avgas is heavily laced with the octane improver tetraethyl lead (TEL), which also does nasty things when it blows by the rings and gets into the crankcase. (Back in the days that cars ran on leaded gasoline, oil change intervals were typically 3,000 miles instead of 7,500.) So one of the most important reasons that we need to change the oil regularly in our Continentals and Lycomings is to get rid of these blow-by contaminants before they build up to levels that are harmful to the engine's health. Another reason we need to change the oil frequently is to replenish the oil's additive package, particularly its acid neutralizers. When sulfur and oxides of nitrogen mix with water, they form sulfuric and nitric acids. If you remember these dangerous corrosives from your high school chemistry class, you'll appreciate why you don't want them attacking expensive engine parts. To prevent such attack, aviation oils are blended with acid neutralizer additives. These are alkaline substances that neutralize these acids, much as we might use baking soda to neutralize battery acid. Because these acid neutralizers are consumed by the process of neutralizing acids, it's imperative that we replenish them before they get used up to an extent that might put our hardware in jeopardy. At each oil change, it's essential to change the oil filter and cut open the old filter for inspection. We also strongly recommend sending an oil sample to Blackstone Laboratories in Ft. Wayne, Indiana, for oil analysis. Although there are a number of different labs that do such analysis, we think Blackstone is head and shoulders above the rest, and we urge our clients to use this lab exclusively. When I read the words MOBILE 1 synthetic I was jolted because years ago when Mobile AV 1 oil came out I installed it in my new TIO360 engines. I extended the oil interval to 50 hours. In about 150 hours both engines failed cause of lead in the crankcase. Lots of lead. Seems the synthetic oil would not stay in suspension till the oil change. 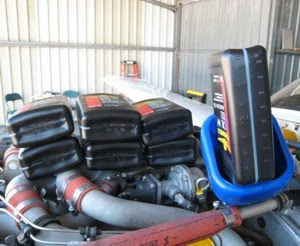 In another related artical you mention that it can be useful to monitor how fast your oil gets dirty. Is there a series of oil blots somewhere to match my Oil's color against? Example: put a drop of my oil on a white 3X5 index card and match the color (darkness) against a series of industy sample oil blots. I invision using the dipstick to get the oil drop sample... this seems to be quick and easy so i can get a sample oil blot every 5 or 10 hours.